On the surface Contrast boasts a wonderful art style, visual design and a has gorgeous song that immediately plays upon loading the game. As Dawn, a young girl's imaginary friend, you are shown that everyone else are merely shadows to you in this world. Didi doesn't want to stay in bed at night and you help her explore the town and solve some of the problems of her parents. However, increasingly bland and unimaginative puzzles, clunky control of Dawn and a camera that struggles to cope with one of the main mechanics of the game detract from the wonderful visual direction greatly to the point where it was difficult to enjoy anything about the game. Didi lives with her mother, Kat, who works nights as an up and coming club singer. Her father, Johnny, has been kicked out the house after his poorly executed antics finally took their toll. Being a child, Didi doesn't quite realise the reality of the situation and employs her imaginary friend Dawn to help. Your first objective is to aid Didi in sneaking out of her room and going to watch her mother's performance. Contrast starts out with great promise. Upon leaving the house via the window you are greeted with a small expanse of the town. 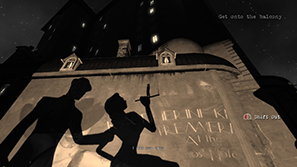 The graphic quality was instantly impressive, as was the lighting – an imperative feature of the game. In each act you are given a part of the town to explore in which there are collectables and luminaries (a type of energy source) to be found via mini-puzzles. All the levels in the act can be found in buildings in this area. Didi's adventure nearly didn't get started. The cart she uses for a safe landing from her second storey bedroom had been moved and there was no way down. She saw a shadow along the wall leading from the platform to the ground below. To solve this she decided that Dawn can become a shadow on 2d walls and use the other shadows around her as platforms. As Dawn is her imaginary friend she can make up the rules as she goes along and give her whatever ability she can think of. This is a fantastic way of introducing new abilities and character mechanics but is only used once more in the game. The narrative in Contrast revolves around Didi and her parents. Her Dad is in trouble with local gangsters as he tries yet another one of his poorly thought out schemes in a bid for an income and to impress Kat to the point where she takes him back. The dialogue is mostly well written and the voice work is great, though I did find the gangster characters a little silly. Ultra forgiving at times and resorting to violence far too quickly in some scenarios make their personalities hard to believe or understand. For all this promise, Contrast has an overwhelming amount of problems. While the beginning of the game is great, it quickly runs out of ideas and resorts to repetitive and unimaginative puzzles. In the second act there is a level in which you need to carry surprisingly large boxes and place them on floor triggers in order to open doors. After you encounter this level nearly all level's puzzles are this. Grab a box, find a way to move it to the floor trigger, put on trigger. And repeat. Seeing the same box model in increasingly inappropriate locations was just frustrating. Why were there boxes there? The answer; so you can solve the puzzle. Little context to why they were there. One thing that really frustrates me in games is lack of contextual continuity within the world. Only Didi can see Dawn yet in one level you have to perform a Limbo-esque sequence on a projector screen with narration from a different character. How can he see you? Why doesn't he question that the shadow is being made without the use of the puppet? If the game was set up so that people could see you when you are a shadow that would be fine but that doesn't happen at any other point of the game. Another thing was in the first level. You need to move lights across a stage to highlight the performers. As soon as you do this they burst into life and begin playing their instruments. Later on in the game any characters you encounter automatically have a spotlight shone on them as they talk. It just all felt inconsistent. Contrast isn't much fun to play. Dawn controls somewhat imprecisely and you'll find yourself missing easy jumps, making really large jumps, being thrown out of a wall as a shadow for no reason and generally not doing what you input. The camera is a bit of a nightmare too, throwing itself into walls or corners and is a real nuisance. There are many bugs I encountered too: clipping through objects, camera zooming suddenly inside my head so that I saw the back of Dawn's eyes, sliding along the ground without control when landing a jump. Also, invisible walls. No! On top of all these control problems and bugs the game isn't rewarding or creative and the final act felt incredibly rushed. There is a second story arc and this is explained to you in the final twenty minutes of the game using a third of the game's collectables lined up in a short and obvious manner telling you exactly what happened. It's like they ran out of time to explore this story, or forgot about it and implemented it at the last minute. This was very disappointing as I personally thought this narrative was more interesting than the main one I had followed throughout the game. Also, don't get me started on the ending. I can't explore the problems I had with it without spoiling but let's just say it was baffling; not to be confused with misunderstanding. The music started out really well, with Kat performing a song and atmospheric pieces accompanying your exploration of the town but increasingly becomes underwhelming, to the point that much of the third act was played in silence. With exception to the final third, the collectables are fairly fun to collect. 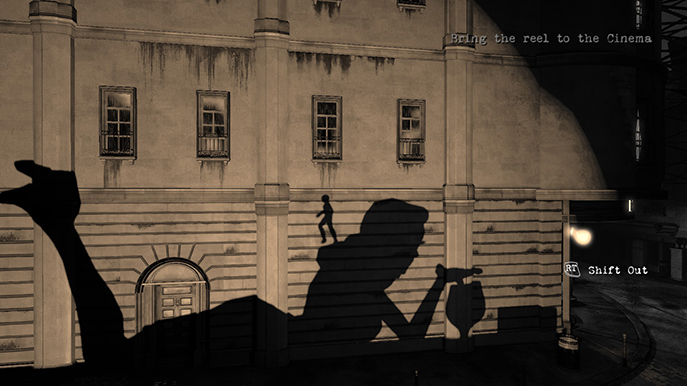 One of the most creative and underused puzzles in the game was activating a silhouetted version of an earlier scene projected on the wall and you have to use the shadows at platforms to reach your reward. You are required to collect luminaries in order to progress in some areas but these are easy to find among the levels and open areas. 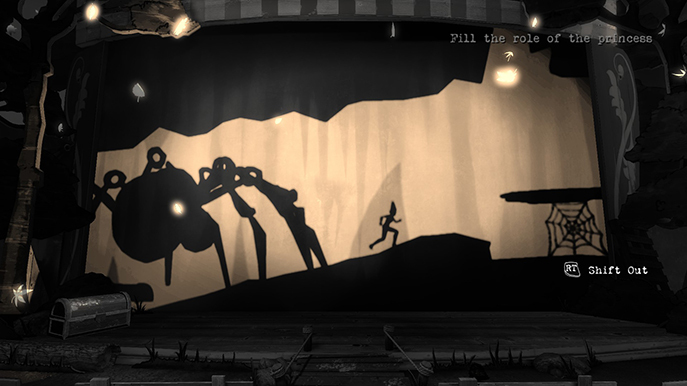 Contrast felt like a confused, rushed game that didn't get anywhere near it's potential. 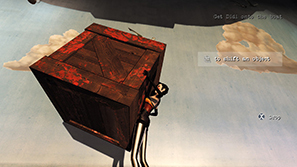 The numerous bugs and control issues combined with repetitive, uninspired puzzles harm the enjoyment that could be taken from the visual design and atmosphere. The narrative trips over itself as it races to conclude before the gameplay wraps up and while understanding what happened, it still doesn't make sense. There are too many inconsistencies and variables that can't work together and some things are just left unexplained. I have no idea why the town has floating land masses and chairs and no character seems bothered about it. The world of Contrast is only worth experiencing for the atmosphere, graphics and visual design. It falls flat in every other aspect and proved a huge disappointment. + Wonderful visual design and graphics. + Small puzzles using character's silhouettes on walls are creative. - Clunky control of Dawn. - Camera frequently gets in the way and acts erratically. 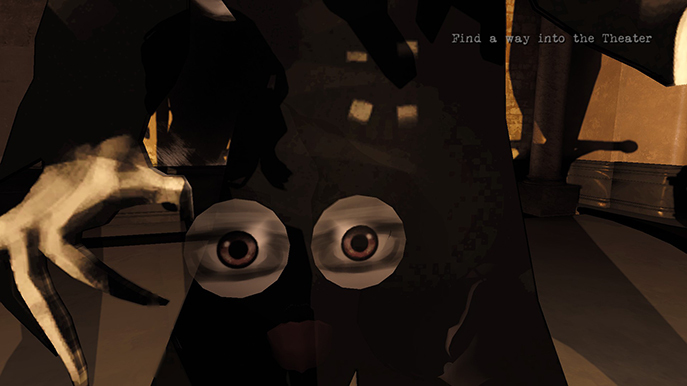 - Repetitive, unimaginative and uninteresting puzzles. - Story is a mess.